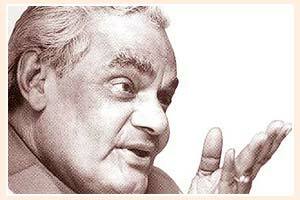 Atal Bihari Vajpayee was born on 25 December 1924. He was the Prime Minister of India briefly in 1996, and again from 19 March 1998 until 22 May 2004. His involvement in politics began as a freedom-fighter during the Quit India Movement of 1942-1945. In December 2005, he retired from active politics but still participates in national debates of policy, welfare and defence. He has been a Member of Parliament since 1957 and is a senior leader of the BJP and Indian politics. Vajpayee is also a poet and a writer. The Kargil War took place in his tenure. In 1992, he was conferred Padma Vibhushan and in 1994 he was honoured with Lokmanya Tilak Puruskar and the Pt. Govind Ballabh Pant Award for the Best Parliamentarian.